Hurricane Irma was on its way, and people were evacuating all over Florida. Jessica Lewis lives in a little college town with her dog, Luna. Jessica heard the warnings to leave town, so she made preparation to head “home” to her parents right outside of Atlanta, GA. 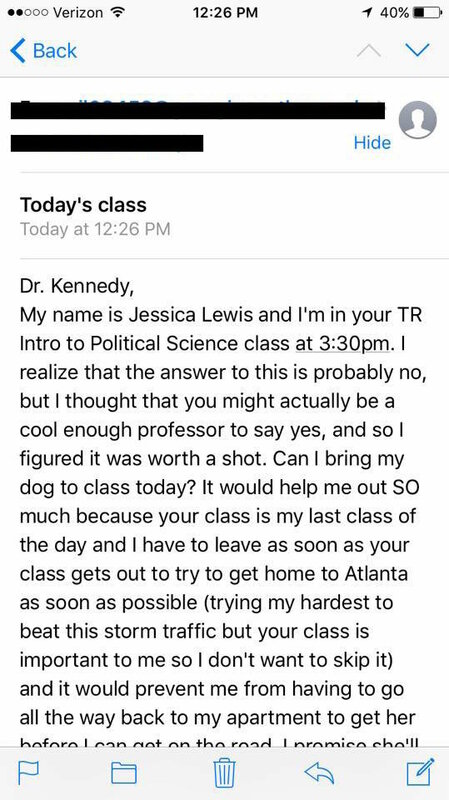 Classes were starting to be canceled, but Jessica had one more class to attend before she, and Luna, could bark on their adventure ahead of the storm. Jessica was trying to plan out her trip, so she could definitely be gone before the storm hit. The quickest way to leave town would be to take Luna to school with her. She would have never have thought about taking Luna to school before, but due to the emergency, she decided to email her instructor and ask for permission. 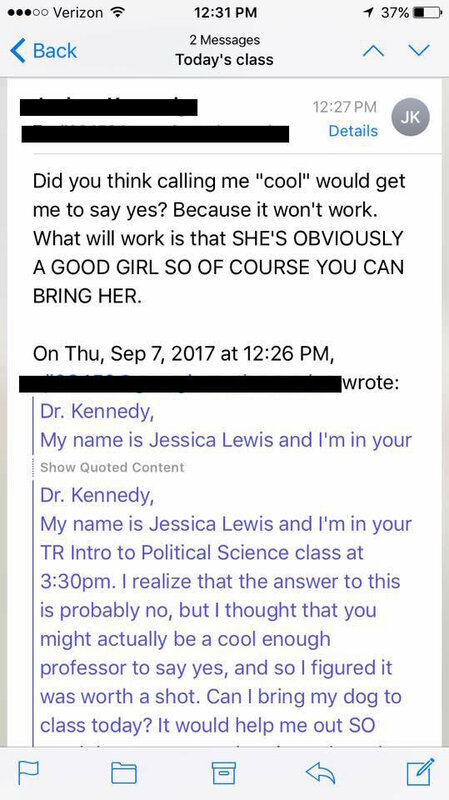 Her nerves were getting in the way when she was typing the email to her teacher, but she typed up a thoughtful and detailed email, begging him to allow Luna to be in class that day. 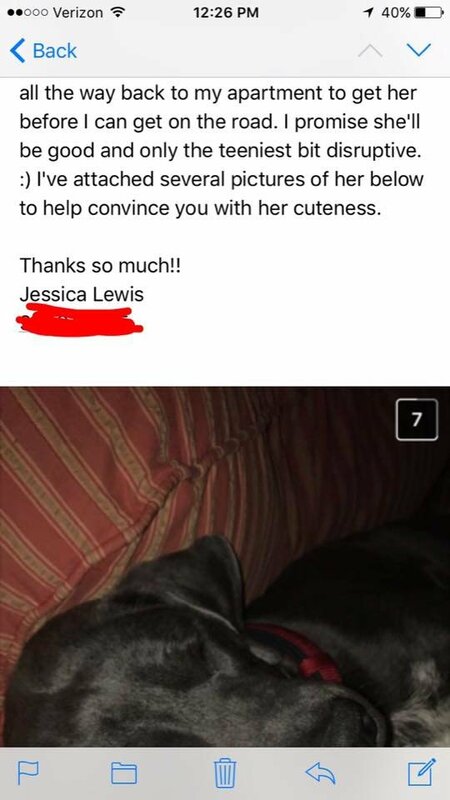 Jessica even attached a few pictures of her dog to the email, to help persuade the instructor to allow Luna to sit in the lecture. She clicked send. As she sat around staring at her screen and biting her fingernails, waiting on the response to her email, Luna laid peacefully on her lap. The response came quickly. Once opened, Jessica realized she had nothing to be nervous about. 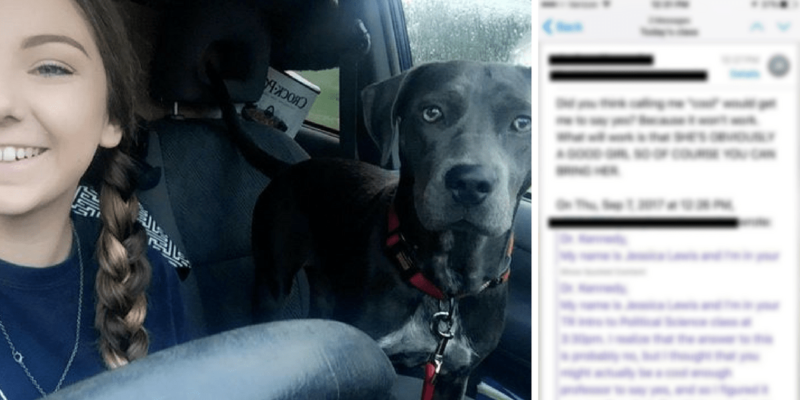 Lewis was unaware that her instructor was an avid dog lover, and was almost excited to have Luna as a guest student. What better way to celebrate the last day before a hurricane. 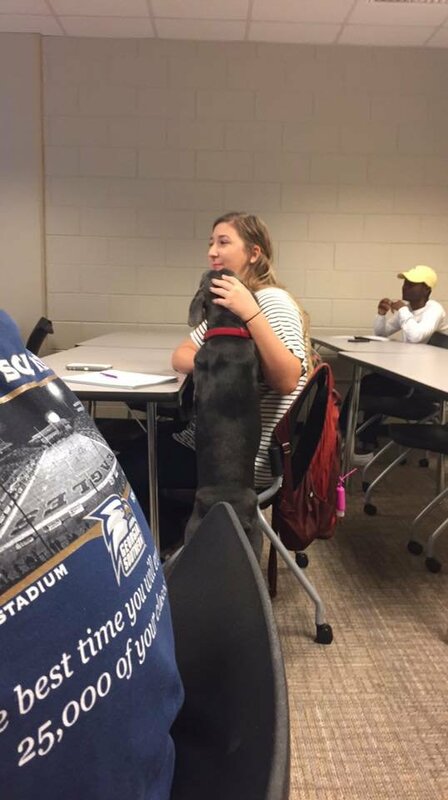 Lewis’ classmates even enjoyed Luna’s presence in class. 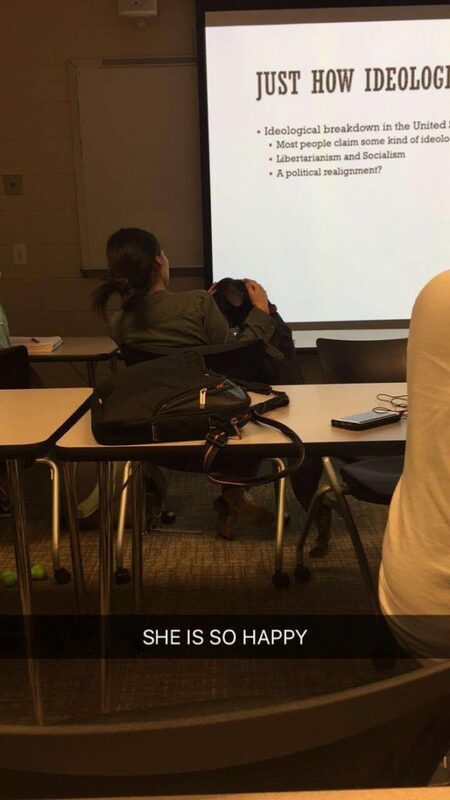 She was an attentive, interactive student for the entire hour and a half class. 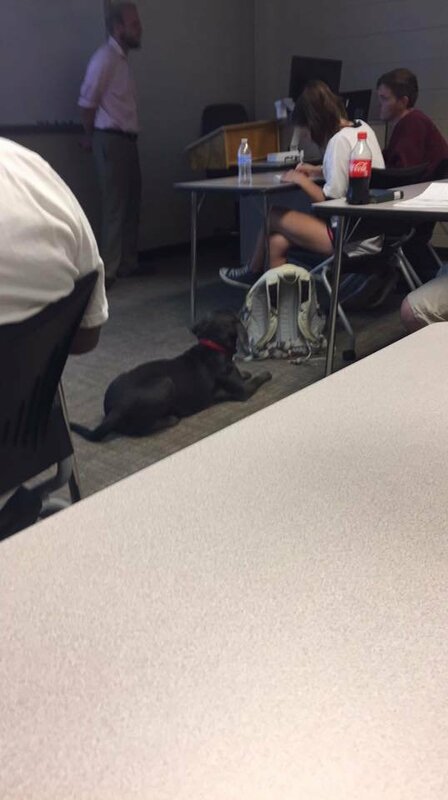 Of course, Luna may have been a bit distracting during class, she made the day a little better. The classmates enjoyed holding and petting her, as you see in the pictures above. Luna lit up the room the day before the storm. Even the instructor enjoyed Luna’ s interaction with the lesson. If you were to ask Luna how her day was, she loved it. When the class came to an end she did not want to leave the school. But Hurricane Irma wasn’t waiting for anyone, so they had to hit to road. Jennifer and Luna arrived in Georgia safe and sound. Their family was excited to see the pair arrive home before the storm. If this story made you smile, SHARE with friends and family so Luna’s lesson can bring smiles to those outside of the classroom too.